This page displays the results of your object search. The format of the display depends on your search type and the output you requested. HTML-formatted text is designed to be easily read by eye on your computer display, while ASCII and XML VOTable output is appropriate for computerized applications. This help page discusses the output as formatted for the HTML pages, but the comments about the data here also apply to the data displayed in any of the output formats. All formats have headers briefly explaining the data output. If you searched NED using "Near Name", "Near Position", or "IAU Format", the objects are listed in order of increasing distance from the center of the field. If you used a "By Name" (with the extended name search flag set), "By Refcode", "By Classifications", or "By Parameters" search, the objects are listed in order of increasing Right Ascension. You may choose a different sort order on the search input pages in the "Output Parameter" section. By default, if fewer than five objects are returned by a search, their Basic Data will be included on the same page as the summary list. If more than five objects are found, click on the sequential number at the beginning of each line to see the Basic Data for that object. The number of objects with detailed data that will be displayed on the same page as the summary list may also be changed in the "Output Parameter" section of the search input pages. NED's default is to use an ASCII table for the summary list; this displays long lists more quickly. An option on the search input page allows you to choose an HTML-formatted summary list; this is easier to read, but is slower to display long lists. If you wish to make a finding chart of the objects returned by your search, click the highlighted "Skyplot". This will display a table with the coordinate data for your objects. If you wish, you may modify the table before plotting the data. The Source List is preceded by a header line, the number of objects returned by your search, and a link to plot the search results on the sky. A sequential object number applicable to this list only. One of NED's names for the object; other names can be seen in the "Cross-Identification" list below. An asterisk preceding the name indicates the presence of an "Essential Note"; these follow the Data Index for each object. Right Ascension and Declination for the object at your requested output equinox (default is J2000.0). NED's "Preferred Object Type" (e.g. "G" = galaxy, "GPair" = double galaxy, "RadioS" = radio source, etc.). If you used the "By Classifications, Types, Attributes" search, NED's standardized classifications are shown if available; the Morphological Type is first, the Spectral Type follows. The heliocentric redshift, if known, listed first as V = cz for V < 30,000 km/sec, then as z. A qualifier on the redshift. These are often taken from the published source (a colon ":" or a question mark "?" are common), but are sometimes added by NED to indicate a non-spectroscopic origin for the redshift -- "PHOT" for photometrically-measured redshifts, or "EST" for redshifts estimated by other methods. NED's Basic Data magnitude and filter, generally in an optical band. Distance in arcminutes from the search position or from the position of the named object, if applicable. Number of literature references in NED for the object. Number of literature or catalog Notes stored by NED for the object. Number of photometric data points stored by NED for the object. Number of position data points stored by NED for the object. Number of redshift data points stored by NED for the object. Number of diameter data points stored by NED for the object. Number of NED associations for the object. Link to the images for the object in NED's image archive. Link to the spectra for the object in NED's spectral archive. Finally, the sequential object number from the first column is repeated for convenience. Because NED is frequently updated, any of these data may be changed or supplemented when more or better data become available. Also, because NED's images and spectra are currently stored in different internal databases, we do not yet display the number of images or spectra held for a given object. However, clicking on the "Retrieve" link in the "Images" or "Spectra" columns will retrieve all images or spectra currently in NED. This section of the output page is preceded by an Index containing links that will display all of NED's data for each object. Each section is blocked off on the screen for readability. The Index also has a cutout from the Digitized Sky Survey for the object, and -- if there are any data points in NED's photometric database for the object -- a postage stamp version of the Spectral Energy Distribution. These link to the image database and the photometric database, respectively. Note that the DSS preview images, generated "on the fly" during your object search, are centered on NED's current position for the object. Many DSS images -- specifically for large galaxies, and for groups and clusters -- are included in NED's image database accessible through the image link. These images are independently-generated cutouts centered on earlier, possibly less-accurate positions. While we update these "pre-cutouts" periodically if they differ by more than 10 arcseconds from current positions, there remains the possibility that these "pre-cutout" positions will be centered on slightly different positions than the "on-the-fly" DSS images. Finally, the Index has a list of links to NED's databases of spectra, redshift-independent distances, literature references, redshifts, diameters, positions, notes, associations, and major catalogs. Click on any of these links to see the additional data. Essential Notes calling attention to e.g. errors in positions or identifications in published catalogs, confused radio sources, etc. All the Cross-Identifications in NED for the object, originating from a process using positions (with uncertainties), redshifts, and morphological information, as available in the related catalogs and journal articles. The name prefixes are linked to information about the catalog or paper in which the name originates. The reference code for the position adopted by NED. This is linked to NED's bibliographic database so that you may easily see the full reference and (for papers later than 1988) the paper's abstract. Equatorial and ecliptic positions for B1950.0 and J2000.0. Equatorial positions are given in sexagesimal units as well as in decimal degrees. Galactic and supergalactic positions in decimal degrees. We compute Galactic coordinates following standard IAU practice with the north Galactic pole at RA = 12h 49m, Dec = +27d 24m and the longitude origin at 17h 42.4m, -28d 55m (B1950.0). We follow RC3 and calculate supergalactic coordinates with the north supergalactic pole at lII = 47.37d, bII = +6.32d, and the longitude origin at lII = 137.37d, bII = 0.0d. Position uncertainties in arcseconds given as the 95% confidence ellipse semi-axes and position angle; or, for galaxy pairs, triples, and other multiplets, the radius of a circle enclosing the positions of the two or more galaxies. A summary table of Redshift-Independent Distances showing the mean distance modulus (in magnitudes) and metric distance (in megaparsecs) with their standard deviations, and the minimum, maximum, and median values. There is also a link to the Detailed Listing of individual values in NED's redshift-independent database. A summary table of Classifications (Types and Attributes) with one classification from each of the following categories, when available: "Galaxy Morphology," "Radio Morphology", "Distance Indicator", "Kinematics", "Activity Type", "Luminosity Class", and "Hierarchy". A link to the Detailed Listing of the individual classifications is provided, too. Three different estimates of the Foreground Galactic Extinction. See this FAQ page for more information and cautions on using the extinction values returned by your search. The first extinction estimate gives the total absorption Aλ in magnitudes at several optical and near-infrared wavelengths, based on the Schlafly & Finkbeiner (ApJ 737, 103, 2011) recalibration of the Schlegel, Finkbeiner & Davis (ApJ 500, 525, 1998) extinction map. The second extinction estimate is based on the the original prescription of Schlegel, Finkbeiner & Davis (ApJ 500, 525, 1998). Third is the total absorption in B magnitudes, based on the prescription of Burstein and Heiles (ApJS 54, 33, 1984) and references therein), modified in the area of M31 to show only the Galactic extinction, not the Galactic extinction affected by the HI emission in M31. No extinction is calculated when |b| < 10 degrees; a few other small gaps occur in the Burstein-Heiles extinction maps (see AJ 87, 1165, 1982) where no extinction can be calculated. The heliocentric radial velocity or redshift, with its mean error when known, and reference code (again linked to NED's bibliographic database). number of galaxies or population. indicative population or richness class. description (e.g. "blazar", "BSO", "Sy1"). origin of the source (e.g. "IRAS FaintSrcCat(v2)"). size of source (in arcmin). NED's Basic Data -- diameters, magnitudes, morphological types, flux densities, spectral indices, cluster populations or richnesses, and so forth -- are generally NOT on homogeneous systems. 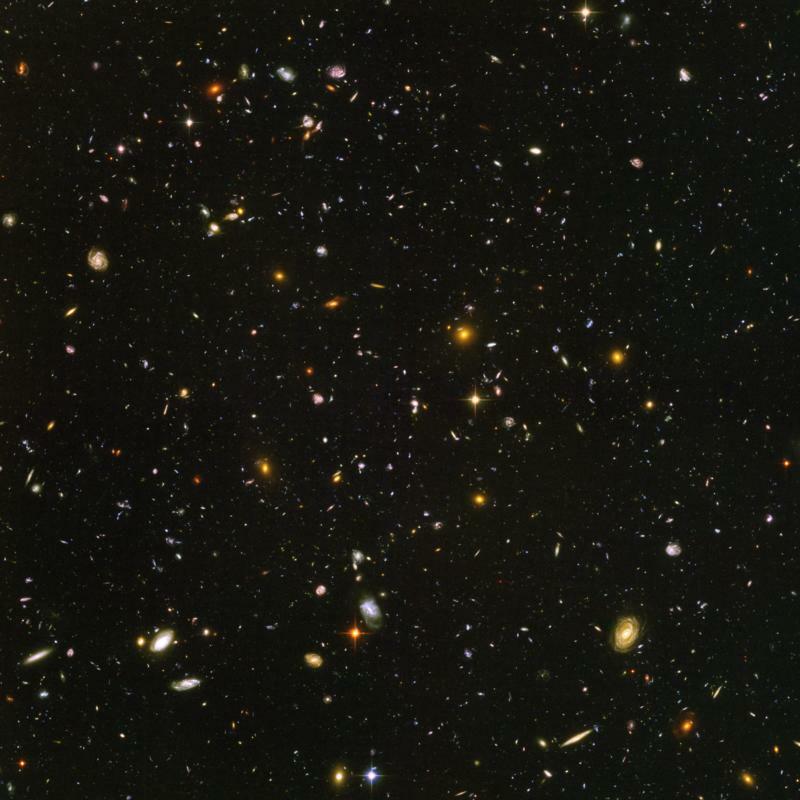 While we have used data from large compilations such as the Sloan Digital Sky Survey, The Third Reference Catalogue of Bright Galaxies (RC3), the Hewitt-Burbidge compendia of QSO's, or the Abell catalog of rich galaxy clusters whenever possible, there are many hundreds of thousands of extragalactic sources represented in NED that are not listed in these more specialized catalogs. Thus, we have taken basic parameters for these other objects from available literature sources. We give preference to large catalogs (e.g. SDSS, 2MASS, APM, IRAS, CGCG, UGC, 87GB) over shorter lists, but the data have not been reduced to homogeneous systems. The Basic Data values are intended only to provide convenient, representative, first-look parameters for the object. Most objects in NED have more extensive, detailed, multi-wavelength measurements for redshifts, photometry, and diameters available using links in the Index section of the results page. V (Heliocentric) in km/s with its error (if known) and source, calculated from V = cz. No relativisitc correction is applied to these apparent redshifts (see John Huchra's discussion of extragalactic redshifts for more information), so velocities in excess of the speed of light can be displayed here. V (Galactocentric GSR) in km/s calculated as in RC3. V (Local Group) in km/s based on the formulation by Karachentsev and Makarov (AJ 111, 794, 1996). V (3K CMB) in km/s using the CMB dipole model presented by Fixsen et al. (ApJ 473, 576, 1996). V (Virgo Infall only) based on the local velocity field model given in Mould et al. (ApJ 529, 786, 2000) using only the term for the influence of the Virgo Cluster. V (Virgo + Great Attractor Infall only) again based on the local velocity field model given in Mould et al. (ApJ 529, 786, 2000) using the terms for the influence of Virgo Cluster and the Great Attractor, but not the Shapley Supercluster (we thank Jim Condon for his code for this model, on which we have based ours). See Mould et al. Appendix A or click here for parameters of their local velocity field model. V (Virgo + Great Attractor + Shapley Supercluster), once again based on the local velocity field model given in Mould et al. (ApJ 529, 786, 2000) using the terms for the influence of the Virgo Cluster, the Great Attractor, and the Shapley Supercluster. The errors in the model parameters for each correction are added in quadrature to the error in the galaxy's redshift as follows: 4% of the GSR correction, 6% of the Local Group correction, 7% of the 3K CMB correction, and 7% of the velocity field correction. Hubble Flow Distances and Distance Moduli, with their errors, calculated from the apparent corrected velocities using the cosmological parameters that you chose on the search input page (defaults are H0 = 73 km/s/Mpc, Ωmatter = 0.27, and Ωvacuum = 0.73). No derived distances are given if the corrected velocity is negative. Scale at these Hubble Flow Distances in parsec/arcsec, kiloparsec/arcsec, kiloparsec/arcmin, and megaparsec/degree. You may search for physical companions with known redshifts with an "Environment Search". The default values are calculated to correspond to 750 kpc at the distance of the galaxy, and to be plus or minus 500 km/s. You may change these values by entering you desired numbers in the boxes. Click "Submit Environment Search" to initiate the search. Several quantities derived from the redshift corrected to the reference frame defined by the 3K background, and further corrected using the cosmological parameters that you chose on the search input page (again, defaults are H0 = 73 km/s/Mpc, Ωmatter = 0.27, and Ωvacuum = 0.73). We thank Chris Burns (OCIW) for the code behind these calculations. Further explanation of the calculated quantities is available through Ned Wright's Cosmology Calculator web site, and through Alberto Cappi's CosmoTools web site. Calculated distances and scales for galaxies with heliocentric velocities less than 500-700 km/s -- particularly in the Virgo Cluster area -- should be treated with considerable caution. Many of these nearby galaxies have individually-determined distances given above in the list of redshift-independent distances. These are generally much more accurate than the calculated distances presented here, and should certainly be used in preference to the calculated distances. If you wish to change the cosmological parameters used to calculate the derived values, you may do so by entering them in the appropriate boxes. WMAP Three-Year (Spergel et al. ApJS 170, 377, 2007) and Five-Year (Komatsu et al. ApJS 180, 330, 2009) values may be entered by clicking the appropriate buttons. You may also choose which redshift/velocity correction is used as input for the calculations of luminosity distance and cosmology-corrected quantities (the default is the redshift corrected to the 3K cosmic microwave background). After you have made your selections, click the "Submit Changed Hubble Parameters" button; the page will refresh with the new derived values displayed. Also included are absolute magnitudes or luminosities (νLν) calculated using the average value of the redshift-independent distance, or the distance calculated from the redshift (if no redshift-independent distance is available). No k-correction has been applied, nor have the data been corrected for foreground extinction. where νLν☉ is in solar units, νLν is in watts, fν is the object's flux density in watts/m2/Hz, and D is its distance in meters. Quick-Look Angular and Physical Diameters. The largest visual and near-infrared diameters are listed, as available. Links to External Archives and Services. This section of your NED results contains two subsections distinguished by the nature of their hyperlinks. The list of NED names for an object returned by your search is compared with a list of related on-line astronomical services that are specific to the survey or catalog associated with the NED names. For example, if the object has an NVSS name, a 2MASS name, and a UGC name, only links to data services referring to NVSS, 2MASS, and UGC are listed. Click on the links to access these external data services. Because these links are keyed on object names based on multi-wavelength cross-identifications, the data returned are relevant to your object with a high degree of certainty and reliability (but see Notes and Caveats below). Services currently accessed include catalog queries through VizieR (CDS) and LEDA (Lyon Extragalactic Database); and image and catalog data for large surveys such as 2MASS (IRSA, IPAC), FIRST (NRAO), and NVSS (also at NRAO). The second subsection lists links under "General Archive Resources". These are not necessarily tied to a specific name prefix. When the service supports a name-based query, the primary NED name (the first name listed in the Object Names columns above) is used; otherwise, the query is based on the position of the object. These external archives may or may not contain observations relevant to the NED objects in your list; you will have to run the query and explore the results. (Again, see Notes and Caveats below). On-line resources currently queried here include infrared mission archives at IRSA (2MASS, MSX, IRAS, WISE), optical and UV mission archives at MAST (HST, IUE, EUVE, GALEX, etc. ), high energy mission archives at HEASARC (HEAO, GINGA, EXOSAT, EINSTEIN, XTE, ROSAT, etc. ), the IMPReSS tool used to visualize observation coverage maps (GSFC), the Astrobrowse tool (HEASARC) used to explore astronomical resources, the SDSS Sky Server, the UZC Spectral Archive at SAO, the NVSS image archive at NRAO, the ATNF Observation Log, the VLA Observation Log, and a name-based object query to SIMBAD. NED does not automatically poll all of the above services and include a link only if data are available. This would take too much time -- we want to display your NED query results as quickly as possible. While many queries to external services will return relevant data, some queries may return nothing because observations for the given object (or near its position) may not be available in all archives. Results from an external archive may be unexpected. For example, a query to MAST on "3C 279", returns not only IUE, EUVE, and HST observations of this QSO, but also an observation of the planet Mars with the GHRS instrument on HST. This is not an error, but is due to the fact that MAST -- and many other archive services -- do position searches rather than name searches. The NED name is converted to a position and a default radius, and all observations within that search radius are returned. In this example, it may be of interest to know that Mars has appeared close to 3C 279. This could spur, for example, an archival investigation into possible occultation measurements with resultant information about the apparent size of the QSO, Mars's atmosphere, etc. Objects with name prefixes or suffixes added by NED, such as "NED01", square brackets, colons, etc., are stripped off before building the link to the external archive. Typically, this means that the search will return data relevant to the parent object and not to an object with name prefixes or suffixes. For example, the link to a catalog search for "NGC 3690 NED01" becomes "NGC 3690", so the data returned by the external service will refer to NGC 3690. Also note that the availability of these external resources is under control of the corresponding external servers. Thus, the response time to your query will depend on the state of the external server -- its Internet connectivity and its usage load, and even whether it is currently on-line or not. Finally, a few of the SDSS spectroscopically-observed objects will not link correctly with the SDSS server through the "External Archives and Services" link that appears for them in this section (an example is SDSS J132958.87+471557.4, a knot near the nucleus of NGC 5195 = Messier 051b). These are usually found in sections of the SDSS that have been masked because of the presence of nearby bright objects (in the case of this example, Messier 051 itself). The positional uncertainty is given as the semi-major and semi-minor axes of the 95% confidence ellipse, and the position angle (East of North) of the major axis of the ellipse. The two-dimensional 95% confidence ellipse corresponds to 2.5 sigma (where sigma is the standard deviation). Note that this is not the same as the one-dimensional 95% confidence interval; that corresponds to 1.96 sigma, assuming a normal (Gaussian) distribution of residuals about the mean value. A few large lists of positions which do NOT appear in print are given bibliographic reference codes which point to papers explaining the measurement and reduction techniques. For example, positions taken from the Guide Star Catalog carry a reference pointing to "The Guide Star Catalog. II. Photometric and Astrometric Models and Solutions" in AJ 99, 2059, 1990; and positions for reference galaxies in the Lick Northern Proper Motion survey carry a reference to "Lick Northern Proper Motion Program. I. Goals, Organization, and Methods" in AJ 94, 501, 1987. Some unpublished positions measured by members of the NED team are referenced as "Internal NED Report", followed by the team member's name. On most NED pages, the displayed precision of a position is dependent upon the 95% confidence ellipse (2.5 times the standard deviation) assigned to the semi-minor axis of the position uncertainty ellipse. Here is a table, with examples, showing the displayed coordinate precision for different ranges of uncertainty. Only the calculator and the initial object list page displayed after an object search do not follow these rules. The calculator always displays 7 significant digits in RA seconds and 6 in Dec (i.e. a 95% confidence ellipse of >= 0.00125 arcsec), while the object list always gives 3 significant digits in RA seconds and 2 in Dec (95% CI of >= 12.5 arcsec). regardless of the accuracy stored in NED. All velocities in the table are in km/s. VH is the observed mean heliocentric velocity of the cluster, VLG is the mean cluster velocity corrected to the center of the Local Group using the standard 300 sin(l)cos(b) calculation, VField is the adopted model infall velocity at the position of the Local Group, "Radius" is the adopted radius of the cluster in degrees, and VRange is the heliocentric velocity range within which cluster galaxies are found. This model assumes that all galaxies within "Radius" of the center of the cluster (given by RA and Dec), and within the given velocity range, are cluster members. Any galaxy meeting these criteria is assigned the mean heliocentric velocity of the cluster for calculation of its distance. Note that the declinations of the Great Attractor and the Shapley Supercluster given in Table A1 of Mould et al. should be negative, and that the minus signs in their Equation A2 should all be positive. Back to the Data Search Input Page.